David Middleton has an interesting essay on ocean pH here. This study alone gives the lie to the claim made in the high priests' critique of my Times article that no average net effect can still mean harm, because it can mean (say) an ocean with more jellyfish and fewer corals. Shrimps, corals, starfish, red algae, green algae, snails, clams, and worms -- all either unaffected or beneficially affected. Sounds pretty diverse to me. by contrast Middleton's post is full of...graphs. Real data. Here's one that I've referred to before, showing that coccolithophores like higher CO2 levels. This one was especially amazing. It's a graph Middleton made from data used by a paper in Science. First, the calcification rate on the Great Barrier Reef has been rising, not falling, over recent centuries, at a time when CO2 levels have been rising. Just as I have been saying: CO2 dissolves in seawater to make HCO3 and HCO3 is the fuel corals use for calcification. Other things being equal CO2 fertilises coral growth. 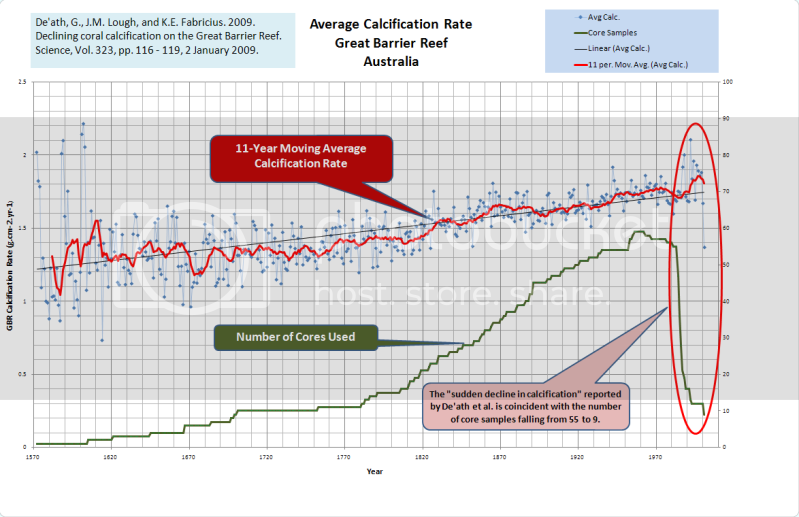 [Corals'] skeletal records show that throughout the GBR, calcification has declined by 14.2% since 1990, predominantly because extension (linear growth) has declined by 13.3%. The data suggest that such a severe and sudden decline in calcification is unprecedented in at least the past 400 years. Third, note the drop-off in sample size near the end.